The trailer opens with Peter Parker, the Amazing Spider-Man (Jake Johnson), settling into a morning routine he’s more than used to, an older and...let’s go with wiser-ish version of the webhead than we’re used to: settling in with a cup of coffee, a copy of what is presumably the Daily Bugle, and a vantage point to look over his friendly neighborhood. “My name is Peter Parker,” he tells us. “And you probably know the rest.” Boy howdy mate, do we. “I saved the city, fell in love,” Peter continues. 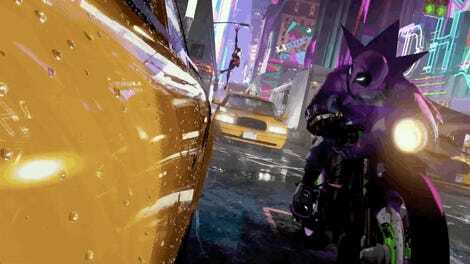 “Then I saved the city again, and again, and again.” This dialogue is cut over what is obviously a loving nod to Sony’s first crack at the Spider-movie whip: Sam Raimi’s original Spider-Man trilogy. It’s evoked as the background for this world-weary version of Spider-Man’s career with the beloved runaway train sequence and an alternate take on the café kidnapping scene from Spider-Man 2, and the infamous upside-down kiss between Peter and MJ in the first film. Here’s another montage from Peter’s career, once more referencing the Raimi films here and there: there’s fights with Scorpion, what looks like the film’s over-sized take on Green Goblin, Doc Ock, and a very “Spider-Man No More!” style alleyway shot reminiscent of Spider-Man 3. Even though this Spider-Man is presumably not meant to specifically be an older version of Tobey Maguire’s character, it’s a very fun little touch. Plus, who can say—it might end up being him after all, if this film gets as crazy as we think it could. Or Maguire could pop in somewhere else! Cereal, comic books, Christmas albums: If you hadn’t got the message yet, this is an experienced Spider-Man. He’s been around, and all this web-slinging is old hat! 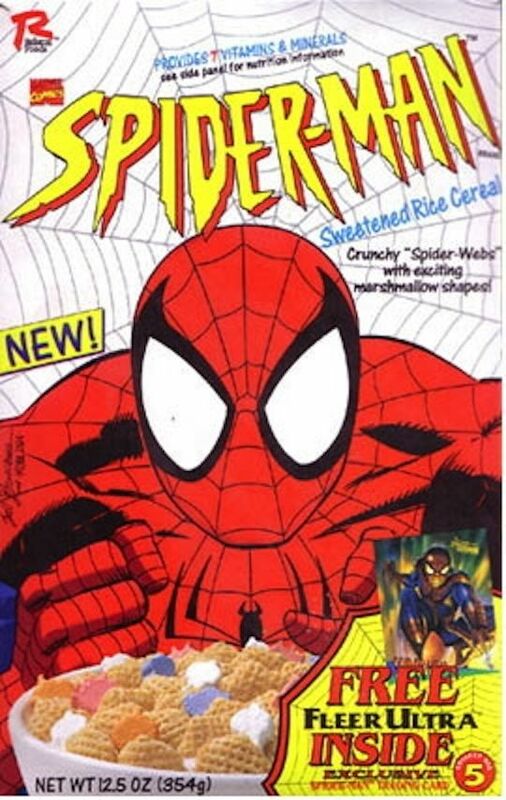 In our world, Spidey has been on all sorts of branded cereals like the Spidey-O’s, but actually got his own in the ‘90s to promote the Fox Kids animated series. “The True-Life Tales of Spider-Man” is also inspired by the real world—it’s actually depicting the real cover art from Amazing Spider-Man #186 by Keith Pollard and Gaspar Saladino, published in November 1978. Sadly, we don’t have a Spider-Man Christmas album (our own Beth Elderkin is working on one), but we do have Spider-Man: Rock Reflections of a Superhero! We’re still not done with references to goofy real-word Spidey products though. 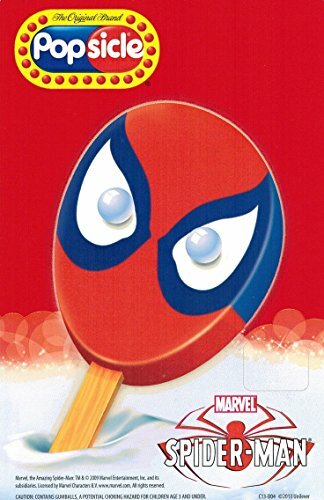 The “so-so popsicle” is actually a reference to a real-world Spider-Man popsicle with gumball eyes, infamous for...well, looking a bit so-so. “But this isn’t about me... not anymore,” Peter says, as we see the first signs of this movie being about different universes. He swings by a street filled with signs for familiar products, only for it to glitch and turn into similar-but-not-quite versions, as we’re introduced to the world of Miles Morales (Shameik Moore): the Ultimate Spider-Man, named for the fact that he lived (originally at least) in the Ultimate Marvel Universe in the comics. Whether it’ll retain that naming or even its comic book Earth-numbering (Earth-1610, fact fans) remains to be seen, but this is definitive confirmation that this Peter and Miles are from different universe, rather than this being the older Peter of Miles’ reality—who, judging by the first trailer from a while back, is dead. Or maybe he dies early on in the movie? 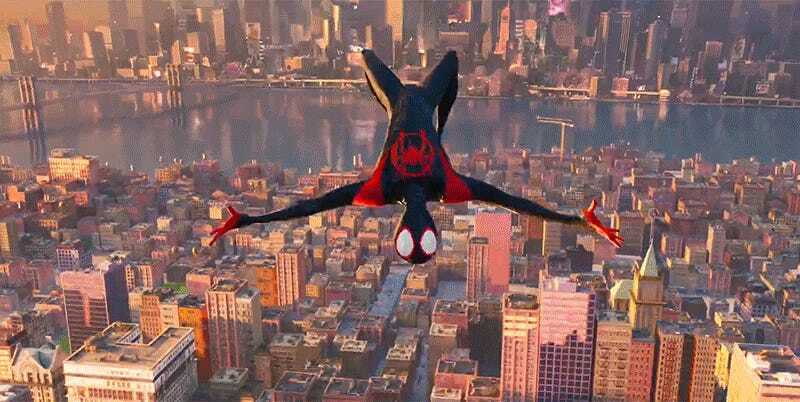 We get a conversation between Miles and his father, Police Officer Jefferson Davis (Brian Tyree Henry), who complains about Spider-Man swinging around fighting bad guys and leaving the mess for the cops to pick up. 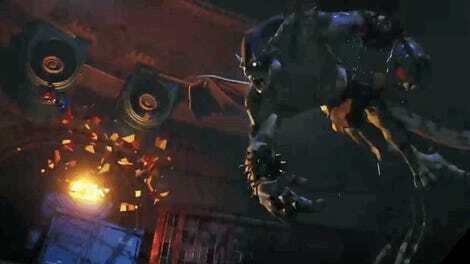 So there is at least a Spider-Man in Miles’ reality, seemingly before Miles himself becomes one. It’s difficult to tell how early on in the film this is. We saw this extended joke of Jefferson using his police authority to embarrass his son in the last trailer, but it is still very delightful here. “My name is Miles Morales, the one and only Spider-Man,” he then tells us, as we cut from shots of him running around the bustle of New York to swinging around in his very own spider-suit. Maybe the line’s taken out of context, but the Spider-Man of his universe dying, leading to him getting his powers and taking up the mantle for real—as it was in the Ultimate comics—would make sense. A particle collider being tested by none other than the Kingpin of crime, Wilson Fisk (Liev Schreiber). We get to see Peter pulled through the multiverse into Miles’ reality, and the Spider-Men meet for the first time—confirming at least here that Miles has already been bitten and developed his Spider-abilities. Peter, at the least, is aware of the possibilities of parallel realities, as he goes on to explain to Miles through the most scientific of mediums: fries. Has he already had a “Spider-Verse” sort of event before? Or is he just older and used to weird comic book stuff being a thing? Either way, as with most expressions we’ve seen from this Peter, he’s very nonplussed about the whole thing. Miles has his powers here, but hasn’t really gotten a costume yet, as we see him suit up in what is basically a Halloween costume approximation of Peter’s red-and-blue suit to hone his abilities. Please note, and appreciate, Peter keeping his sweatpants on. Gwen Stacy (Hailee Steinfeld)! Better known as Spider-Gwen, the Spider-Woman of Earth-65 in the comics. She was introduced in 2014 just ahead the Spider-Verse comic event Into the Spider-Verse is named for and very, very loosely inspired by. Love the hair-do, Gwen. A brief montage of Gwen as she explains that she is from another another universe gives us a moment of her in action—both as Gwen Stacy, drummer for the hit band the Mary Janes (lead by, duh, Earth-65's Mary Jane Watson), as she is in her reality in the comics, and as Spider-Woman. A lovely note is that the coloration and hazy background of Gwen’s Earth is actually directly inspired by the background artwork and colors of Robbi Rodriguez and Rico Renzi, the art team on Gwen’s ongoing comics series introduced in the wake of Spider-Verse. Just as Miles begins to wonder just how many Spider-folks can exist, we meet three more in rapid succession, first confirmed as being in the movie at San Diego Comic-Con earlier this year. First up is Spider-Man Noir (voiced by, yes, really, Nic Cage), the Spider-Man of Earth-90214. He first appeared in Marvel Comics in 2009, and he’s from the ‘30s, battling against corruptive influences and gangsters at the height of the Great Depression. Then there’s Peni Parker of Earth-14512 (Kimiko Glenn), the biologically-linked pilot of an enhanced mecha called the SP//dr. She was introduced, like Gwen for Spider-Verse, in its prequel comic series, Edge of Spider-Verse. And then...there’s Peter Porker of Earth-8311 (John Mulaney). Better known as the Spectacular Spider-Ham, Peter was a spider bitten by a radioactive pig. Specifically, the Aunt May of his universe, a scientist who accidentally doused herself with radiation. Spider-Ham was introduced in a gag edition of Marvel Tales in 1983, as part of a universe of Marvel characters turned into zany cartoon animals, and has since repeatedly shown up as a reminder that Spider-Man comics are extremely weird. In the background, you can see that Peter’s been working on connecting all of these shenanigans to a few of his most famous villains, including the Green Goblin and Kingpin—so perhaps the Kingpin behind it all isn’t from Miles’ Earth, but Peter’s, and sends Peter there in the first place? This entire Spider-meet-cute seems to take place in the older Peter’s base of operations, but whether it means Miles and Gwen have traveled with him back to his reality is uncertain—presumably, the grey-haired woman we briefly see is his version of Aunt May, rather than the May of whatever Peter exists (or did exist) in Miles’ reality (unless it is her, in which case, that’s going to be an emotionally gut-wrenching meeting). Also, fun little aside: blink and you’ll miss it, but in the hall of Spider-Man costumes behind the group in this scene you can briefly glimpse the Advanced Suit designed for the recently-released (and downright excellent) PS4 game Marvel’s Spider-Man. As the Spider-gang reunites—it’s frankly animation wizardry that Noir, Peni, and Spider-Ham all have their own unique animation and art styles compared to Miles, Gwen, and Peter!—Gwen lays out their mission: they need to get back to their universes and sort out what’s going on, otherwise the entire multiverse could collapse. Right on cue, we see some weirdness happening back in Miles’ reality, as Officer Davis witnessed a building getting a very funky-looking facelift. “Brooklyn is gonna collapse,” Miles gasps. “My family lives in Brooklyn!” And we finally get to meet a few more members of Miles’ family: primarily Aaron Davis (Mahershala Ali), Miles’ uncle. In the comics, Aaron is an important figure in Miles’ life because, in several iterations of his existence (he’s had a few retcons, like when he came over to the main Marvel universe after Secret Wars), Miles is raised alone by his dad after the death of his mother, Rio. That doesn’t appear to be the case in Into the Spider-Verse—we see her as Miles hugs his father in the next shot after this—but what is is that Aaron becomes a threat to Miles as he becomes the criminal known as the Prowler. ... And we get to see the Prowler in action moments later, as he chases Miles—who, note, is in his Peter-Parker style suit, rather than his own black-and-red costume, as he’s chased down by his own uncle. The Kingpin growls (presumably to either Peter or Miles) that New York is his city, as we see Miles tussle with two familiar Spider-Man villains: Tombstone, a mobster who eventually got superhuman abilities, including nigh-invulnerability to injury, and Scorpion. This is presumably the Mac Gargan version of Scorpion, the most famous of the people to use that mantle after being injected with Scorpion DNA and given an advanced suit in an attempt to create a person who could defeat Spider-Man. In Into the Spider-Verse, he’s got a wildly different look from the comics, first revealed in toy form a few months ago, which makes him look like a cyborg scorpion. It seems like not all of these villains are from the same universe, just like our heroes—most are, presumably, from Peter’s reality rather than Miles’, especially as we saw a similar Scorpion tale in the flashback earlier. Maybe even Kingpin isn’t from Miles’ reality, and is muddling with various universes from Peter’s Earth. It’s hard to really say, but it wouldn’t too surprising if the Collider technology was being used to unite both Amazing Friends and Sinister Foes. As we cut between high-flying action shots of Miles and Gwen—and Peter lovingly examining a photo of Mary Jane—Miles warns that the Spider-team’s victory will come at a cost: if he destroys Kingpin’s Collider, the gates to the multiverse will break down, potentially destroying the connections to their worlds (or even the worlds altogether). It’s no great power, great responsibility, but Peter calms the panicky Miles with a lovely message, as we see Miles continue to swing through Brooklyn, now in his own costume: In a world of Spider-Men, Women, (and Hams), what makes each of them unique and different is what really makes them heroes. Presumably seeing so many Spider-heroes—and potentially losing his own universe’s Spider-Man early on—gives the teen an identity crisis that he’ll no doubt overcome at some point in the movie. You know, character growth and stuff! We then get a beautiful little nod back to Miles and his Dad’s joke from earlier in the trailer. 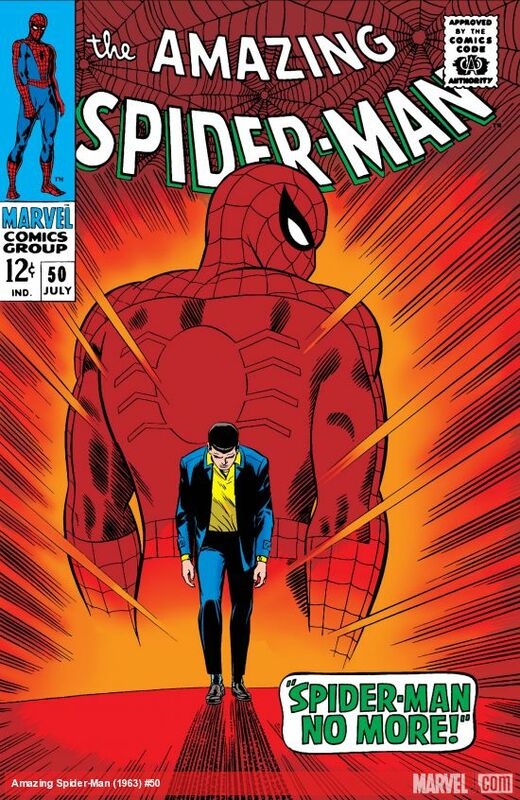 Miles, now in costume at the scene of a crime as Spider-Man, lowers his voice and tells Jefferson that he loves him...much to the confusion of Officer Davis, of course. The team tries to hide in the bedroom we saw earlier...which, if this is them back in Miles reality, seems like it could be the bedroom of Into the Spider-Verse’s version of Ganke Lee. Ganke (who’s typically portrayed as a super nerd in the comics) is Miles’ best friend and closest confidante about his Spider-secret. If Miles is hiding the Spiders in his room—and this is Ganke—he presumably knows the secret here too... even if he’s very surprised at the existence of a whole multiverse of them. Or he’s about to get a Death Star-dropping shock à la Spider-Man: Homecoming, in which the character was named Ned but was essentially a stand-in for Ganke. Fun little note: Maybe-Ganke is reading a comic titled Imagine That... There Was More Than One Spider-Man, including a few alternate Spider-people that seem like they’re references to the Six-Armed Spider-Man of Earth-92100 and someone who looks a lot like Ultimate Jessica Drew, the Spider-Woman of Miles’ reality in the comics. It’s a nod to the series in the real universe called What If..., which imagined zany parallel realities featuring things like Jane Foster finding Thor’s hammer (perish the thought!) and whatnot. The final shot of the trailer mirrors the opening, this time with Miles in Peter’s place, placing his mark (literally, in the form of tagged name sticker) on a similar but slightly more Panther-looking gargoyle as Peter did, overlooking his own version of New York and standing tall as the one-and-only Spider-Man. But hey, speaking of Panthers...that last shot remind you of anything? This latest look at Spider-Man: Into the Spider-Verse is delightfully jam-packed with some hilariously deep cuts to Spider-Man lore, as you can see from all the amazing Easter eggs we’ve just pointed out. But it also tells us way more about the film than our first few looks ever did—even if it’s all jumbled up in multiversal mayhem, we’ve got a much better picture now of what to expect when Into the Spider-Verse swings into theaters December 14. If you spotted any more Spider-hints, let us know in the comments!